I’m going through old pictures on my phone and sometimes I can’t get over how embarrassing I am. Let’s just say the pictures I found include, but are not limited to, a picture of my face cropped onto Gretchen Weiners from Mean Girls and a dog and cat cropped onto the faces of Regina George and Karen. So there’s that (this picture will not be posted, thank you very much). BUT, I did find this picture of me (below) which makes me look way cooler than I actually am. SO, I’m going to post it and pretend I’m cool (I think it’s the fireplace) but also because I try to keep things personal here on Ker’s Corner. I want to give a face to the writing and such. 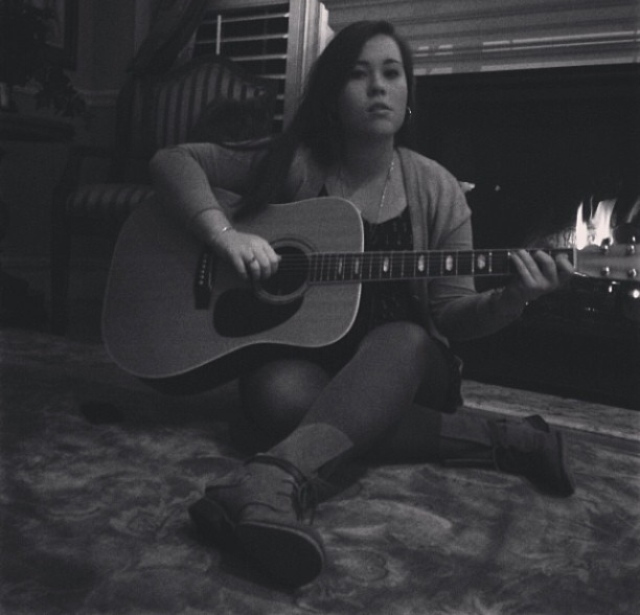 So this is me and what you will typically find me doing (playing guitar, not posting pictures of myself). Have a lovely night/day/afternoon. Time differences, am I right? This entry was posted in Uncategorized and tagged Guitar, Me, Music. Bookmark the permalink.